Last month, I spent an afternoon at SalesLoft in Atlanta. SalesLoft has done an outstanding job hiring a gender diverse team and, having met a few “#LadyLofters” at various events, I asked CEO Kyle Porter if I could spend some time with the women in his organization. I know that many companies struggle to hire women in sales/tech and I wanted to know SalesLoft’s secret. I’ve previously shared my thoughts on the impact of job descriptions in attracting women candidates, but I wanted to know what else our next generation of female sales leaders look for? How do you evaluate prospective employers? "Do the pictures on the website show a good blend of male/female employees?" "During on-site interviews, do they see other women in the office?" "Is the physical layout of the office designed to encourage collaboration?" "How many, if any, women are part of the interview process?" "What’s the tone of the company’s social feeds?" What advice would you give to women either early in their careers or who are considering a sales role? "Recognize when you are getting comfortable and get comfortable being uncomfortable." "You don’t always have to be a team player. Sometimes it is okay to step up and shine the light on yourself." "It is okay to say no. Wearing too many hats means you aren’t focused." "Trust your gut. Don’t stay too long in a role that is wrong for you. It’s okay to move on." "Raise your hand more. Speak up when you know you can add value." We spent a lot of time talking about how the decisions women make in their personal lives impact their careers. Women tend to segue in and out of the workforce and that can be challenging particularly on a sales trajectory—where the mantra “you’re only as good as your last quarter” often reigns. At the end of my visit, something interesting came up. All of the women in that room, myself included, had moms who worked outside of the home. (Now, trust me I know how hard stay at home mothers work – and deserve a mountain of thanks.) What piqued my interest is that we all viewed our mothers as a role model and encouraging us to step outside of the box and into a non-stereo-typically female role. Not a scientific data point, just an interesting observation that came up in our conversation. 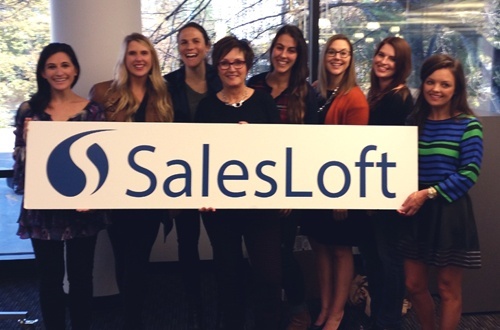 Thanks again to SalesLoft for their invitation and inspiration. Below, I’ve included other resources you might find interesting. PS – Here’s my hit parade of the next generation of women sales leaders from SalesLoft! Lydia Henderson, Margaret Weniger, and Tami McQueen.